Mariah Carey vamps it up! She released a teaser trailer for her eagerly-anticipated new single Beautiful last month. And Mariah Carey decided to debut the entire music video during the semi-finals of American Idol on Thursday night, giving viewers an unexpected treat. In true Mariah style, the glossy new video features wind machines, a series of skimpy outfits and a gorgeous co-star, while she shows off her motorcycling skills. The 43-year-old, who hasn’t released any new material since 2009’s Memoirs Of An Imperfect Angel, is seen riding the vintage bike through a field in the first shot. Not wanting to break from tradition, the star writhes around on the machine wearing a tiny pair of leather hotpants and a curve-enhancing criss-cross cropped top. At one point the star can be seen kicking a pair of expensive Christian Louboutin heels off her feet as she mounts the motorbike. With her hair blowing out behind her, Mariah then rides on the back while Grammy Award-winning R&B musician Miguel, who features on the track, drives through the field. Showing what chemistry there is between the pair, the star sings into her co-star’s ear as they zoom along. Her music collaboration partner – who was named on 2013’s Time 100 Most Influential People In The World as a record producer – can be seen smiling into the side mirror of his car. It appears Mariah Carey’s daughter may be following in her famous mother’s footsteps. 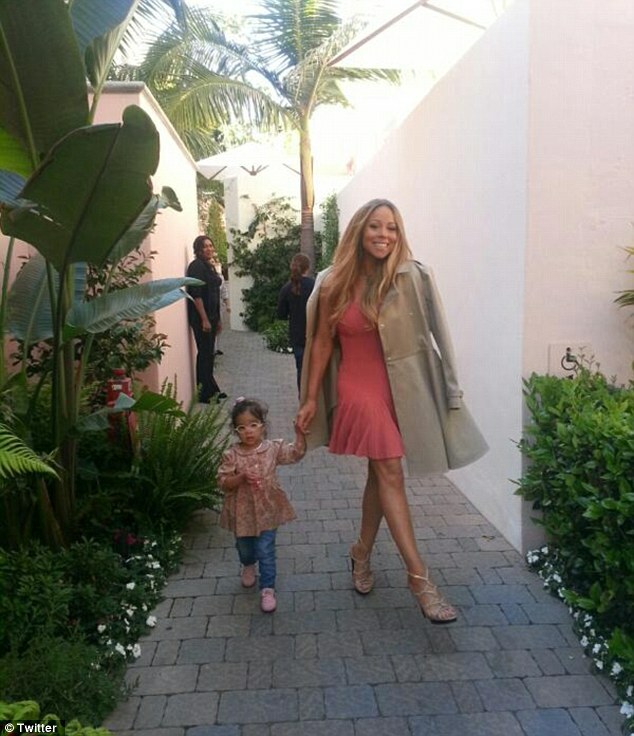 In a series of intimate snaps, the Obsessed singer joins her adorable ‘diva in training’ for a stroll down a stone walkway in complementary pink dresses. Monroe, one, joined Carey as the chart-topper left for a taping of American Idol on Thursday afternoon. The Touch My Body crooner, 43, showed off a set of toned legs in a salmon mini dress with a fluttered hem, a khaki trench coat and metallic heeled sandals. Her perfectly-coiffed honey-blonde tresses accented a golden tan. Monroe matched mum in a pink floral frock worn over a pair of blue jeans and accessorised with trainers, a hair bow and glasses in the same shade of pale bubblegum. Carey wrote of her photogenic daughter, ‘Ms. Monroe walking me out #divaintraining.’ She added, ‘Hate leaving dembabies, be back soon!! !’ Earlier this year, Carey told Barbara Walters of her daughter, ‘I call her Miss Monroe, and that kind of dictated her personality. She’s a total diva. She’s into jewelry. She’s fascinated by jewelry.’ Noticeably absent from the scene were Carey’s husband of five years, Nick Cannon, and Monroe’s twin brother, Morocco.